If you didn’t attend last year’s “Tequila Y Mas” Fundraising event, you will have a third “sip at the glass.” Plan to attend the Third Rio Vista Rotary Club’s “Tequila Y Mas” Fundraising Event. This event is like no other event. Plan to sip and savor over ten (10) premium tequila profiles. At the event you will experience the history of tequila manufacturing, the unique aroma, taste and finish of each brand. Like fine spirits, Tequila favors come from the harvesting of select Blue Agave plants at their prime, capturing the sweetness, and the earthiness of the high and lowlands region in which the agave grows. With each ounce sip of the different profiles (Blanc Reposado, & Anejo) you will taste some of the distinct flavors of citrus, fruit, spices, honey, vanilla, butterscotch, pepper, and oak. These tastes come from the process used to make tequila as well as the barrels (oak, bourbon, whiskey) used to store the tequila. The “Tequila Y Mas” event is more than a night of sipping, it is a learning experience; a night expanding one’s knowledge and palate of a product that is growing interest in the spirits industry. At the event, you will also have an opportunity to sample delicious appetizers from local restaurateurs. If you enjoy cigars, you will have an opportunity to enjoy the stars on the outside patio while sipping tequila. Lastly, since this is a fundraising event, there will be silent auction with items such as tequila, wine, baseball tickets, product baskets, and more. Come for the experience and enjoy the camaraderie all while donating to a great cause – HIGH SCHOOL SCHOLARSHIPS. 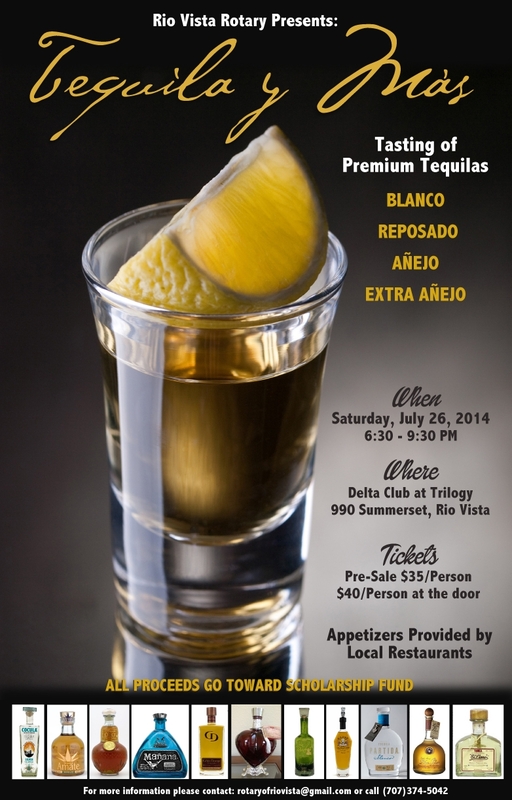 The last two year’s tequila tasting events were a success with over $10,000 raised for scholarships. All proceeds from this event will again go towards scholarships for our graduating seniors. The event is Saturday July 25th at 990 Summerset Drive in Rio Vista. Pre-sale tickets are $30 per person or $40 at the door. Tickets will be available in May and can be purchased at Fosters, The Dollar Store, Pets 4 All, and Book RV, or by email at rotaryofriovista@gmail.com or call Hector (707) 374-5042 for more information. Click here for more photos.